There are 6 Assisted Living Facilities in the Bartlesville area, with 3 in Bartlesville and 3 nearby. The average cost of assisted living in Bartlesville is $3,565 per month. This is higher than the national median of $3,345. Cheaper nearby regions include Coffeyville with an average starting cost of $2,865. To help you with your search, browse the 15 reviews below for assisted living facilities in Bartlesville. On average, consumers rate assisted living in Bartlesville 4.1 out of 5 stars. Better rated regions include Coffeyville with an average rating of 4.5 out of 5 stars. Caring.com has helped thousands of families find high-quality senior care. To speak with one of our Family Advisors about assisted living options and costs in Bartlesville, call (855) 863-8283. Bartlesville’s senior population is 18.1 percent, which is considerably higher than Oklahoma's total senior population of 15.3 percent. Seniors who want to live in Bartlesville but require help with daily tasks can choose from six assisted living facilities, with three of these in Bartlesville itself and the other three in nearby towns like Coffeyville. 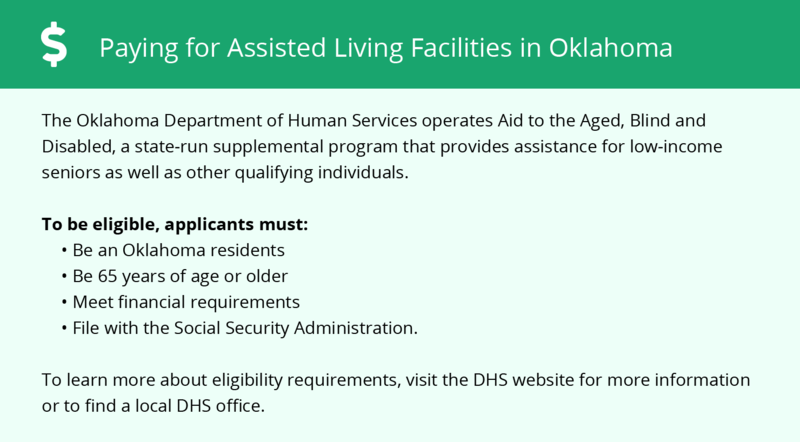 The Oklahoma State Department of Health regulates assisted living facilities in Bartlesville and the rest of the state, which describes them as assisted living centers. These facilities also provide seniors with assistance in daily living activities, eating and personal care. Seniors who live in Bartlesville will need to be aware of its location in Tornado Alley, where tornadoes typically occur in late spring. This region typically has hot summers and cool winters, but the temperature changes can be extreme. For example, the record high for Bartlesville is 115 degrees and the record low is -28 degrees. The cost of living in Bartlesville is quite low, primarily because housing is only 56 percent of the national average. Groceries and healthcare are also relatively inexpensive, at 92 and 93 percent of the national average respectively. Senior citizens should be able to live comfortably in Bartlesville, compared to other cities of its size. Bartlesville’s overall crime rate is relatively high, since 85 percent of cities in the United States have a lower crime rate. However, the rate of violent crime is only 2.97 per thousand people per year, which is considerably lower than the annual rate of 4.5 per thousand for Oklahoma. Seniors in Bartlesville will be safest in neighborhoods like Matoaka/Hogshooter. Public transportation within the city limits of Bartlesville is provided by CityRide, Monday through Friday with limited service on Saturday. Seniors with limited mobility, service animals and personal assistants should call in advance to ensure the proper accommodations can be made. Members of the Cherokee Nation can ride CityRide buses at a substantial discount. Bartlesville has an array of community resources for seniors, including the B-ville 55+ Activity Center, an organization that sponsors many types of card games for seniors 55 and up, as well as more than five other senior centers. The Bartlesville area is home to world-class medical facilities, including Jane Phillips Medical Center, Gemini Medical Group and Access Medical Center, in the event of medical emergencies or illness. Assisted Living costs in Bartlesville start around $3,565 per month on average, while the nationwide average cost of assisted living is $4,000 per month, according to the latest figures from Genworth’s Cost of Care Survey. It’s important to note that assisted living rates in Bartlesville and the surrounding suburbs can vary widely based on factors such as location, the level of care needed, apartment size and the types of amenities offered at each community. 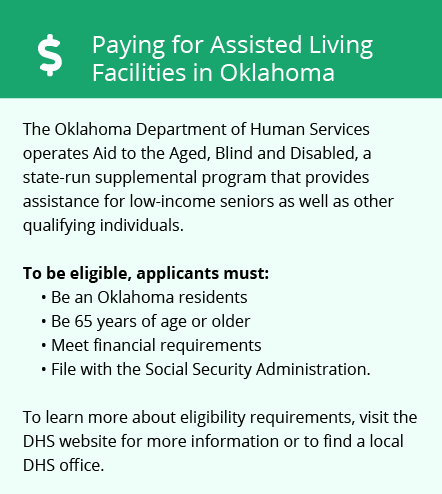 Oklahoma’s ADvantage Program provides Medicaid waivers for residents of assisted living communities. The Medicaid State Plan also provides personal care for persons living in assisted living. Bartlesville and the surrounding area are home to numerous government agencies and non-profit organizations offering help for seniors searching for or currently residing in an assisted living community. These organizations can also provide assistance in a number of other eldercare services such as geriatric care management, elder law advice, estate planning, finding home care and health and wellness programs. To see a list of free assisted living resources in Bartlesville, please visit our Assisted Living in Oklahoma page. Bartlesville-area assisted living communities must adhere to the comprehensive set of state laws and regulations that all assisted living communities in Oklahoma are required to follow. Visit our Assisted Living in Oklahoma page for more information about these laws.